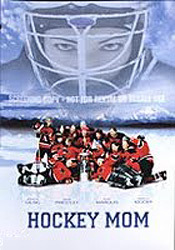 Chicks With Sticks, also released as Anyone’s Game or Hockey Mom, was written by former Calgary journalist Don Truckey, and tells the story of an all-womens hockey team and what goes on both on and off the ice when they take on the local mens team in a winner-takes-all game. Truckey claims that he based some of his characters on girls from his hometown of Westlock, Alberta. The story focuses on Paula Taymore – who almost once made the Olympic team – who finds herself drawn into a challenge match against an irritating local men`s squad. Fresh from a painful divorce, and doubting herself, Paula must make a winner out of an explosive, irreverent crew of women hockey players.